It’s traditionally a short service during holidays, because the opening “Kabalat Shabbat” psalms are omitted. So we are combining services with a special Friday edition of Book Club. In April we will read Maggie Anton’s Rashi’s Daughters, Joheved: A Novel of Love and the Talmud in Medieval France (book one of the popular Rashi’s Daughters series). Learn more about the prolific –and essential – great Medieval commentator, Rashi, in this racy, captivating and fun historical novel. 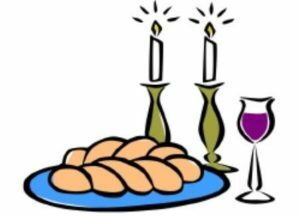 Shabbat and Passover service with Yizkor. Led by Rabbi Metz and Marc Fertik. Series has been moved to Beth Mordecai! Remaining sessions: Tuesdays, 7 p.m. – April 30 and May 14. $10 per class. RSVP to Rabbi.SaraMetz@gmail.com. More information here. An informal weekly meetup with Rabbi Metz for coffee & meaningful conversations about the fundamentals of Judiasm. We are currently reading excerpts from the Talmud in Trachtate Brachot. On May 3, at 6:30 p.m., join Beth Mordecai to welcome guest Cantor Daniel Geigerman – and his guitar – for an uplifting musical Shabbat Service. Chinese food Shabbat dinner to follow, $18 per person. Please RSVP be emailing officebethmordecai@gmail.com.